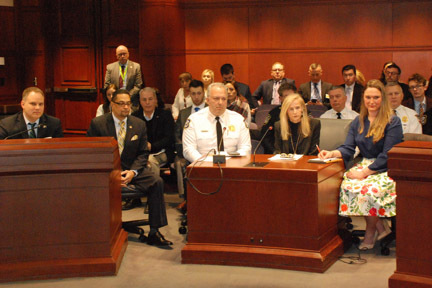 Rep. Ron Napoli (D-Waterbury,) Rep. Geraldo Reyes (D-Waterbury), Waterbury Chief of Police Fernando C. Spagnolo, State Senator Joan Hartley (D-Waterbury and Rep. Stephanie Cummings (R-Waterbury) testify in support of House Bill No. 7332. I joined the Waterbury delegation including State Senator Joan Hartley (D-Waterbury), Rep. Stephanie Cummings (R-Waterbury), Rep. Geraldo Reyes (D-Waterbury), and Waterbury Chief of Police Fernando C. Spagnolo to express support of legislation that would address the escalating public safety issue resulting from repeat juvenile offender motor vehicle theft. HB 7332 aims to hold young offenders accountable and strengthen juvenile justice reform laws. “In 2018, in the city of Waterbury, 972 cars were stolen and the majority of these cars were stolen by juveniles,” added Chief Spagnolo. "52 juveniles were arrested for cases of stealing a motor vehicle, and of them, six repeat offenders were arrested. It is astounding to me that six of the 684 juveniles arrested in 2018 were responsible for nearly 10 percent of the charges brought against juveniles in Waterbury." According to The Sentencing Project, a Washington D.C. nonprofit, motor vehicle theft is the only category of juvenile crime that has seen arrests increase in Connecticut in the last decade. Repeated auto thefts have had a negative impact on many communities across our state. "The way we are handling these juvenile multiple repeat offenders is not working, not only in Waterbury but statewide. We are putting these children at risk and we are exposing our community to danger. This bill, if enacted, will provide consequences for children who are no longer getting the help from community-based services provided by the juvenile court,” said Chief Spagnolo. I am proud to stand with my colleagues to support legislation that would treat repeated auto thefts with a sense of seriousness.